The Chinese Progressive Association organized a rally and community stabilization tour that drew about 70 people. They marched near the luxury Millennium Place condo tower. Metal gates, rusty and rickety, block the doors of the See Sun building on Harrison Avenue in Chinatown, where activists gathered on Saturday to mark the two-year anniversary of what many now see as a bellwether event in the neighborhood’s affordable housing problems. Called to the building in 2012 for a false alarm, firefighters found deplorable living conditions and emptied the residences. “Over 33 households were evicted from the See Sun building in the middle of the night,” Lydia Lowe, executive director of the Chinese Progressive Association, said through a megaphone to dozens of activists outside the building. Those evicted residents, most of them elderly, found homes in public housing, she said, but the affordable housing crisis continues. The association organized Saturday’s rally, which drew about 70 people at 9:30 a.m. to the Chinatown Gate, where they listened to speeches and joined in chants. “We felt we could not let another year go by without taking note of that,” Lowe said of the evictions, just before speeches began. For decades, new arrivals made their homes in Chinatown’s row houses, but increasing gentrification is eliminating that option. “The housing in Chinatown has become a crisis and it’s getting worse and worse,” Jian Hua Tang, who cochairs the association, said in Cantonese, through an interpreter. Most who attended the rally at the gate proceeded with placards to the Harrison Avenue building behind a “Remain, Reclaim, Rebuild Boston” banner. 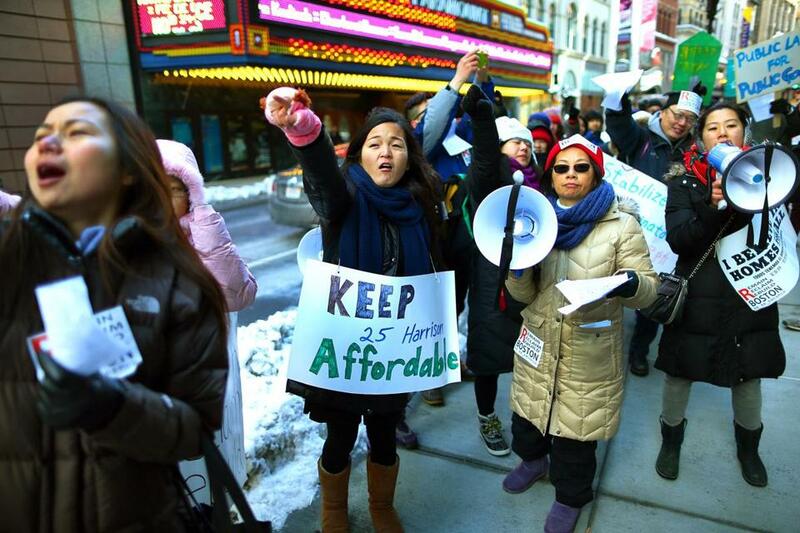 But in Chinatown, “we just need a place to live,” Lorrayne Shen, a Chinese Progressive Association worker center organizer, called out through a megaphone. At the event’s conclusion on Harrison Avenue, marchers highlighted the housing crisis by attaching poster board signs to the See Sun building bearing quotes from residents evicted from Chinatown locations.